A Trip Around the World quilt-top that we made at a past workshop. Pictured are Sammie Wade and Nancy Coomes. 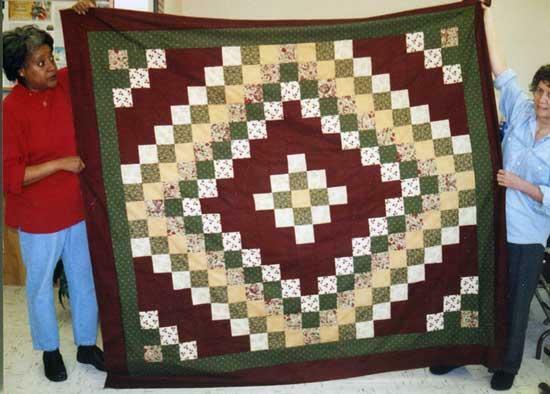 The “Quilt-Top in a Day” Workshop, held annually in Woodbury, is scheduled for January 22 and 29, 2011, beginning promptly at 8:00 a.m.
With the help of a friend, you will complete a quilt-top in a day. Wanda Lawson, our instructor, has selected the “Trip Around the World” pattern this year, made from a series of strips and blocks. An information packet will be mailed to you upon request. To register or to receive more information, contact Carla Bush about the class at 563-2554. The class fee of $40 is due to the UT Extension, Cannon County Office, located at 614 Lehman Street, Woodbury, before Friday, January 14.